NASA to deploy 5 agents in every polling station during the August polls. - Bana Kenya News, Real African Network Tubanane. Home featured News NASA to deploy 5 agents in every polling station during the August polls. NASA to deploy 5 agents in every polling station during the August polls. The NASA coalition has called out the IEBC that they will deploy 5 agents in every polling station countrywide. The agents which will represent the parties will be overseeing the process while taking photos, videos and vote counting. "We wish to remind Kenyans that with 47 days to the election, court processes will no doubt affect the election date." Said the IEBC CEO Ezra Chiloba. The chairman also heeded the printing of ballot papers has not begun as claimed by the Opposition. "For the avoidance of doubt, the printing of the ballot papers has not yet started. We expect it to begin on Friday," IEBC chairman Wafula Chebukati said. "We must avoid the lure to sensationalise the electoral process to the extent that the country is left divided," he added in a statement. "Allegations are being made without any substantiation. This should not be allowed to continue." The coalition claims President Uhuru Kenyatta and his family has close ties with Al Ghurair's owners. Its leaders said senior Jubilee officials are involved in the tender to print 120 million ballot papers, election results forms and poll registers. 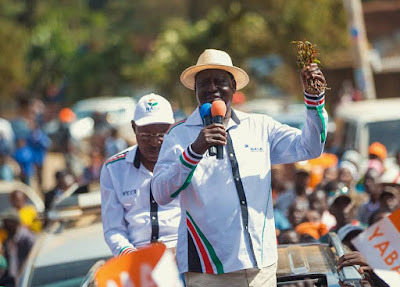 The NASA flag bearer Raila Odinga urged the people to secure their votes because they will not go to court this time round. They have promised people that this August election will be clean and if the IEBC tries to do anything then they will force them to make it free and fair.